Are your feet, like mine, presently covered by shoes and socks? Do your feet, like mine, stink to high heavens when you take your shoes off in the evening? 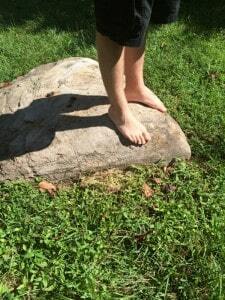 Do your children, like mine, often spend the entire day barefoot? Probably not, unless your children go to Fairhaven School, where bare feet are allowed and quite common to see, indoors and out, especially in the Fall and Spring. We first became aware of Fairhaven’s non-policy toward shoes when one of the young men in our carpool got into our car to come home with no shoes. I suspected he might have lost his shoes, but he nonchalantly let me know differently. I immediately set to worrying about how he might be soiling the interior of my car with his “dirty feet” – a thought that makes no sense at all considering that a) shoes would easily track and shed more dirt than bare feet, and b) the inside of my car is always already a huge mess. It took me only a few hours to realize that my response to his bare feet was a part of my conventional social conditioning; I was aided by my sons’ burgeoning critical thinking skills, as they set me straight when I whined about it at dinner that night. Barefoot walks on the grass or on the beach are recognizable symbols of ease and relaxation. The bottoms of our feet are one of the most sensitive surface areas of our skin, we remember this from early childhood tickle fights. Taking our shoes off at the end of the day is, for most of us, a sign that the work day is over. We visibly relax upon taking off our shoes. Our poor, dear, bacteria-laden feet seem to breathe, and we wiggle our toes, now free of constriction. And there it is, the Earth, right there beyond my window, and here are my feet! It’s so easy, available and free! It’s yet another way that the culture of Fairhaven School has infected our home and shown us a better way to live. Thought I insist we will only pay tuition for the kids. I have been recently making more of an effort to walk barefoot and I am surprised when I take a walk around my yard at how immediately my cognitive functioning switches to sensate awareness, and I sink instantly into a meditative, receptive and relaxed state. You gotta try it, folks. Stomp in a mud puddle. Kick up some sand. Let the dewy green grass tickle your toes, and then send your kids to Fairhaven barefoot, healthy, more fully aware and more ready to learn.